If you are looking for best Crompton Greaves Fans than you can find the best Crompton Greaves Fans here. These ceiling fans can give you best cooling in comparison to other fans which are not good for price. Crompton has good brand value as they give best of value money. You can find many ceiling fans but not good as Crompton. Crompton fans are good as they provide good cooling with less power consumption. Here we are providing review of top 3 best Crompton Greaves Fans which are best among all. This ceiling fan will give you best value of money. With 5 star rating of BEE, this ceiling fan can save most of power. Less light bill will make you enjoy more. Its blades are designed so well that it gives you double reliability and higher air. 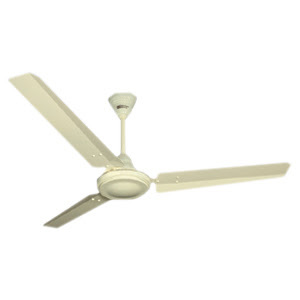 This fan uses 48 inch of 3 blades with consuming 53 watts (while its operating voltage is 220-240 volts. Crompton Greaves HS Plus provides 320 RPM of speed in cooling. Normally, there are many ceiling fans available in market which costs more and consumes more voltages, compared to a 75W 3 blade fan or an 85W 4 blade fan (which consume more electricity) Crompton Greaves HS Plus consumes less light and give more air. By which you can save almost Rs.30-40 per month on your electricity bill. Also, Crompton Greaves HS Plus give you less noise and more air as it is only 3 blade fan while 4 blade fans will noise more. Design point of view, you will not disappointed for sure. Check out the below image, where this 3 blade fan looks amazing on ceiling. You can order in black, ivory or brown color too. If you want smooth running and cool air, go for Crompton Greaves HS Plus, as it gives best value of money. 3 colours (black, brown and ivory white). 2.Does it included with Regulator of speed? No, you need to buy speed regulator separately. 3. How many days it takes to deliver the product? Mostly in 7-10 days you will get your product. 4. How many years of warranty is included? You will get 2 year of warranty (of blade, fan) with package. 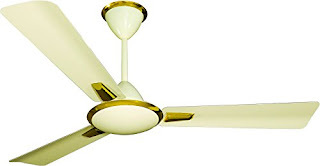 Above mentioned fan is not good at design and if you are looking for bit stylish budget ceiling fan in Crompton than you should go with Crompton Greaves Aura which is quite stylish fan with almost same price. Crompton Greaves Aura have 74 watt and 3 blades. Crompton Greaves Aura gives 1200mm of sweep and 360 RPM of speed (which is more than of above fan). As you can see in above image, the Crompton Greaves Aura is quite stylish but consume more power compared to Crompton Greaves HS Plus. There is not much difference between Crompton Greaves HS Plus and Crompton greaves aura. The only difference is later one is bit stylish and earlier one is cheaper one. Crompton Greaves Aura available in Titanium color and ivory color. Below is image of Titanium coloured Crompton Greaves Aura fan. 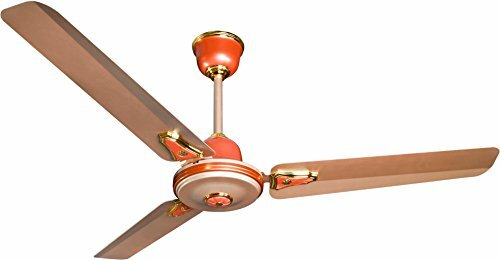 This is 3rd best Crompton Greaves Fan which having better design and available in unique color of ginger gold. Crompton Greaves Decora have 448 inch of length and 70 watt of speed with 370 RPM of speed. These fans have 3 blades and having 1200 mm of sweep. So, if you want high speed, nice design and unique color ceiling fan, you can go with Crompton Greaves Decora. These are top 2 Crompton Greaves Fans which are available in market. All the Crompton Greaves fans provide 2 year of warranty (which will be attached with package of ceiling fan). Also, all fans runs on double bearing and 3 blades which provide high speed and higher AIR. And available on range of Rs.2000-2200/-. All fans are great value of money. Check out each fan and decide which Crompton Greaves Fans you need to buy.